Described by legendary violinist Dame Camilla Wicks as "a genuine artist who has boundless imagination," Wei He has given critically acclaimed solo recitals in Asia, Europe and the United States. As chamber musician, he has collaborated with members of the Juilliard and Guarneri quartets, and the Francesco and Peabody trios. His many awards include top prizes at the Yellow Springs and Carmel International Chamber Music competitions. He also played in the first violin section of San Francisco Symphony for two seasons. Held in high esteem as a teacher, He takes great pride in his student's achievements. 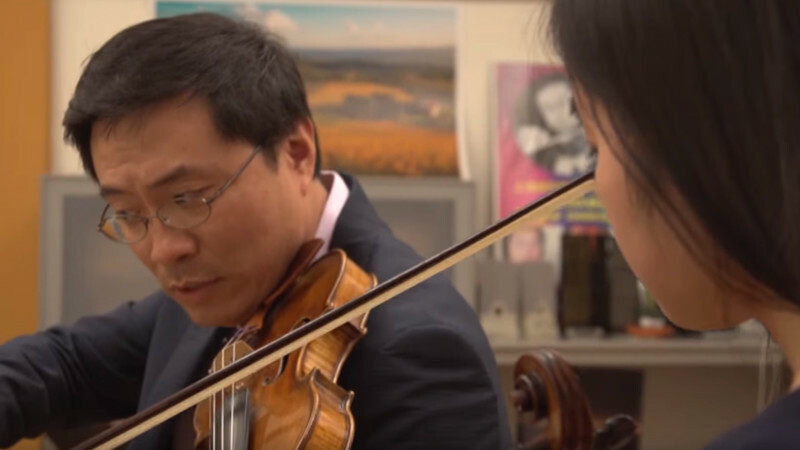 Many of his students have won important competitions including the Astral Artist National Audition, Concert Artist Guild Competition and Menuhin International Violin Competition, and many have soloed with orchestras such as the San Francisco Symphony, China Philharmonic, Korean Broadcasting Symphony and Philadelphia Orchestra, while a number have won auditions with local and major orchestras in the States and abroad. As a distinguished Fulbright Senior Specialist, He gives frequent master classes throughout the United States and Asia. Principle teachers include, Camilla Wicks, Eugene Gratovich and Chen Wenyuan.